Perhaps it’s because my artwork is sitting in Orange County soaking up the sun, I’ve started wearing an LA Dodgers hat, or during my recent trip to LA I drank the Kool-Aid. Regardless, I’m just seeing a glimmer of hope in the otherwise completely annoying world of pop culture. By pop culture, I don’t mean the kardashians or E television, the piranha and parasite of the pop culture industry. I mean more about the pop music artists and movie phenoms that are having a huge impact on younger generations, and by default the more open and older set. I recently read an angry missive by an art critic where he threw up his hands and declared that pop culture is leading the world intellectually, sensually and spiritually. Is it? If you are what you watch, listen to and read then perhaps this is true. So if it is true, what next? The government leaders and school leaders don’t provide much in terms of moral and inspiring excellence examples. Education in the US is a total mess, where research is constantly showing it’s a failure and must improve. Churches are busy telling children and young adults that they are sinful and they better watch out before satan has his way with you. Parents are working harder and more than ever – where is the time to make a major impact with our youth, aka our future leaders? Enter Katy Perry. Daughter of two Pentacostal preachers. Do I think it’s pretty smart to have children as early as 6 listening to her song “Firework?”. Absolutely – it’s incredibly uplifting and inspiring. Not only that but her entire persona is about imagination, having hope, embracing diversity and PLAYING. These are all messages completely devoid in our children’s public schools, and given the fact that we only see our kids at dinner and on the weekends these little bits of imagination and/or inspiration coming from a silly song are little gold nuggets. For this, Katy Perry, I thank you. I only wish I was told as a 12-year old that I was a firework – colorful and powerful. Or that I was a resourceful warrior like Katniss Everdeen from the Hunger Games. Instead I got some like a virgin crap, and a whiney Princess Laia. OK, Pat Benetar I must thank you for I know now that love is a battlefield, and yes you can hit me with your best shot – go for it. But generally, the pop culture that is currently emerging, at least from a female perspective, is pretty inspiring (in small doses and sans a few tracks). A little more on Ms. Perry – Will Cotton did a series of paintings of her in 2010 with names like “Cotton Candy Katy” and “Cupcake Katy” – These paintings lay the entire aesthetic groundwork for her 2011 world tour. Which I would recommend watching snippets of – it’s fun and pure entertainment. Will Cotton is a serious artist who has done some wonderful fundraising collaborations with Creative Time, and generally paints well. I can’t speak for him about his fascination with candy in all of his work – but I think it’s pretty similar to the general fascination with pop culture – it’s addictive, tasty in moderation and ephemeral. I will argue that pop culture, like candy can be good for you – so there is really nothing sinister in his work. 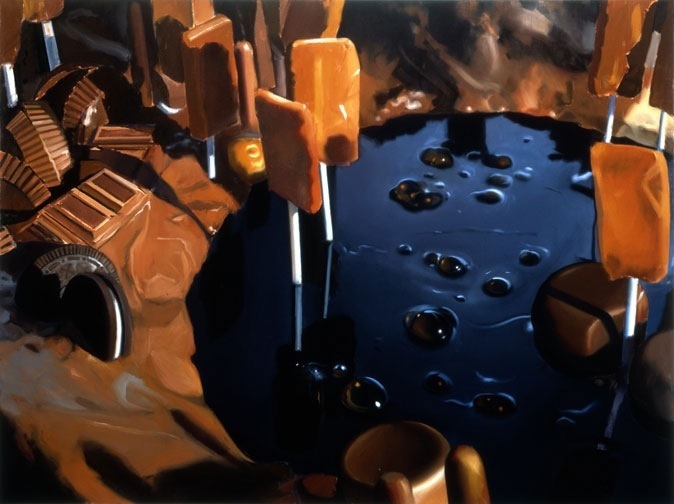 Except for some of the messy chocolate and molasses landscape pieces from the late 90s he’s done which remind me of that feeling of eating too much cookie dough, or looking at Cindy Sherman’s untitled food series from 1986-89 – TOO MUCH!! So in 2013 I am embracing the pop, the cheese, the silly and allowing myself to play just a little harder in the studio. In moderation of course.